My Chinese-American husband grew up in Hawaii, then moved to Los Angeles. Not only did he not care about different seasons, I’m not even sure he knew what they were until I took him to New Hampshire and Washington D.C.
His immigrant family wasn’t big on holidays, either, whether American or Chinese. The man didn’t even have a Christmas stocking until I gave him one. I found out about the Chinese Mid-Autumn Festival from various bloggers like Marta and Constance. I gave up on Andy and turned to the internet. Turns out the mid-Autumn Festival is one of the oldest traditions still celebrated today, dating back to at least the 16th century B.C.E. It may have started as a harvest/ thanksgiving festival, but eventually incorporated Chang’e, the Moon Goddess of Immortality. Chang’e was originally mortal, but drank too much of her husband’s elixir of immortality. (Either to save the world because her husband was corrupt or to save the potion from an unworthy thief, depending on which version of the myth you prefer. I find the first version more realistic.) The excess of elixir sent her floating to the moon, and she’s been there ever since. The mooncakes were created in Chang’e’s honor, possibly because they were her favorite delicacy. Chang’e devotees have traditionally prayed to her for everything from beauty to safety, especially during the full moon after the Autumn harvest. The cakes are often eaten outside, under the full moon, during the festival. So much for Andy’s assumption that no one actually eats mooncakes. Ha! 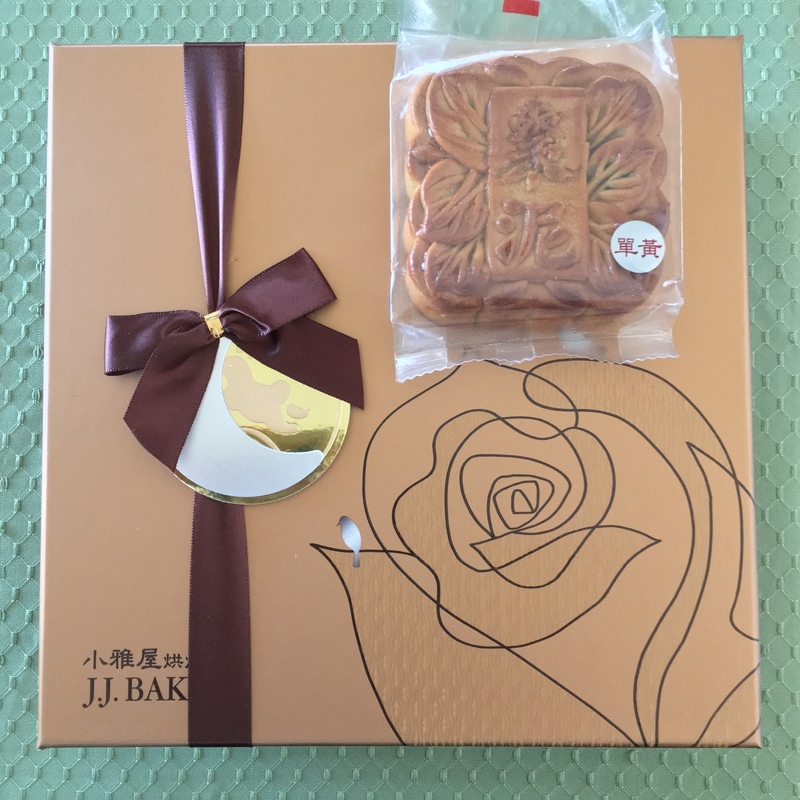 I didn’t have much time between my discovery of mooncakes and the Mid-Autumn Festival, but I found a Chinese bakery (because you can find every food imaginable in Los Angeles). I bought their last box of mooncakes. Those mooncakes came with some dirty looks from customers behind me, looks that shouted, “Hey! What does a white girl need with mooncakes! ?” But I escaped with my prize, and presented the mooncakes to Andy that evening. “Really?” I took a small bite. 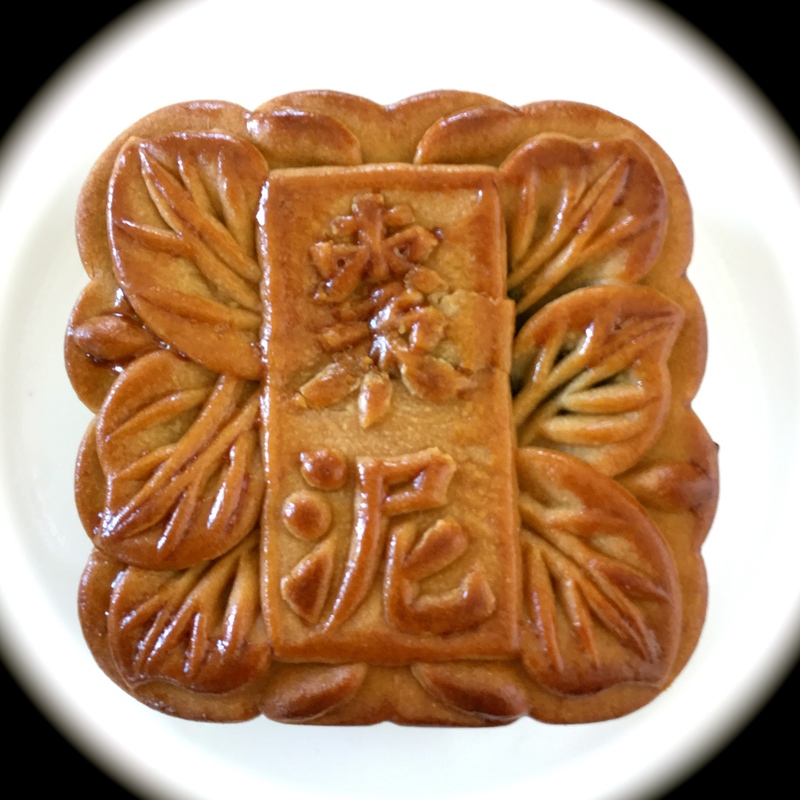 The mooncake was filled with red bean paste. I shrugged. “It’s not bad. Reminds me of jian dui.” I took a bigger bite. And stopped chewing. There was something besides bean paste in the mooncake. Something…salty and not soft. “You didn’t say they were WHOLE DRIED YOLKS! I thought they were beaten in, like regular eggs in regular cake batter. Ew! Bleech.” I pried the offending yolk out and offered it to Andy. The man who eats bulls’ balls, sheep brains, and chicken feet demurred. I left the yolk on the plate and finished the mooncake. It tasted much better without the yolk. Andy turned in time to see our cat’s jaws close on the egg yolk. The cat ran off with her prize. She hid under the table, growling like a feral creature until she finished eating. Like she was warning us not to touch her food. No danger of that, kitty. There are many varieties of mooncakes. Next year, I’ll start hunting earlier and perhaps I’ll find some different flavors. They might taste better. But if they don’t, at least we know someone who will eat them. This year’s box of mooncakes — including lotus filling! Andy was right, haha. I don’t think anyone really likes mooncakes. Except maybe old people. I also don’t think they were originally designed to be eaten by only one person,they are a calorie bomb so I’d rather eat only a small piece. The most popular mooncakes in recent years are ice cream mooncakes by Haagen Dazs. They always sell out, even though they are super expensive! ( I think the fanciest ones are like 10 USD per piece!). Yeah, if you are going to eat a massive calorie bomb, it should be something with Haagen Dazs. And chocolate. Loads of chocolate. Happy Mid-Autumn Festival to you! Did you get Haagen Dazs this year? I think Timo is the only one who can eat ALL the mooncakes. All 26 kgs! Bummer! You’ll have to stand in line next year and buy some. You actually ate mooncake? Ewww. You’re…Brave. I fell in love with Fall, winter, and spring. Summer, not so much. But I do love the seasons. Go with foolish, since I’ve got another round for tonight! I actually don’t mind eating the egg yolk – and the mooncake crust or skin – as it is at all, since I really like eating salted eggyolk. Nothing disgusting for me – just a very nice savoury taste to my tastebuds. Now what I really don’t like about the mooncakes are those that come with the fruit and nut cake. In Malaysia and Singapore sometimes there would be boxes of those at home and they were really hard – I’d be chewing a chewy piece of mooncake and all of a sudden my teeth would clamp down on something hard – like a hardened piece of sugar or nut that could have split my teeth into two had I bit any harder. I’d stick with the plain mooncakes or the ice-cream variety, thank you very much. Some Asian grocery shops in Australia do sell mooncakes all year round, interestingly enough. Oh, I HATE eating something you think is tender and then getting something hard instead. I shudder at the thought. I will be looking out for the fruit and nut ones. Thanks for the warning. You have black Chinese tea at yumcha in Australia? In Hawaii and Los Angeles, it’s green, possibly jasmine. Pretty light and not as bitter as my afternoon Ceylon, even. I love mooncakes. Of course the egg yolk is annoying, but there are versions without, and what I do is extract it out (they’re usually a perfect sphere, so easy to get out) before eating. And as Andy said, they are dense, and are not meant to be eaten all at once!!!! Cur it into quarters and share or save. Lastly, judging by the pic that mooncake brand has a crazy rich amount of lotus paste in it. The best brands are those where the filling in slightly light brown. Ha, I must’ve missed Lina’s post with her mooncake chart. It sounds very useful. No one in LA makes ice-cream ones, though. Too bad, Marta says they are the bomb. Oh, believe me, we did not eat that thing all at once. I just happen to get the center piece with the yolk, while Andy got an edge. Henceforth, I will be looking out for that egg, and for tonight I got some smaller ones. I think one has lotus, too. A box of nine little ones set me back over $20.00. For more calories and less taste than a box of See’s chocolates. Does the MC make growly noises to warn you off his eggs? One of my old boyfriends was Polish. I remember my first Christmas visit with his family. Blood soup! I am not as experimental as you are. I passed on it and much of the other ethnic food. Well, blood soup versus a kind of cake? That doesn’t exactly seem a fair trade. I’m not sure how experimental I would be with that. I can’t bring myself to eat the chicken feet yet, you know. Okay, I guess I’m going to be the outlier here…I seriously LOVE mooncakes. Really love them. I’m actually bummed I’m not in China for the holiday, because they’re one of my favorite things to eat. I do agree the egg yolk varieties are really gross. I would never eat them. (I don’t eat eggs anyway.) But there are some amazing other varieties that have no weird eggs inside of them. I’m a huge fan of the mooncakes more common to the Yangtze River Delta area — those don’t have the eggs in them. In fact, there’s a company in Hangzhou that makes totally vegan mooncakes that have a nice flaky crusts and decent fillings. I remember having my first mooncake two years ago. I had no idea what it was and Derek’s parents had bought my family a box of mooncakes which had all different flavors and varieties in. I absolutely hate egg with a living passion, so thankfully Derek warned me about the yolk and I simply opted to only eat the red bean part. This year, Derek got me a fruity mix! They’re pretty yummy. They taste like feng li su and are even shaped like it, which makes me rather happy! I won’t lie, I like these fruity mooncakes, mainly due to the fact that feng li su is one of my favorite treats! But like that video I sent you on Facebook, I think I would much rather prefer a chocolate coated one with ice cream in. LOL. Derek also isn’t big on celebrating it and in all honesty, if it wasn’t for good ol’ Google and the other wonderful bloggers out there, I probably wouldn’t know much about it. I ‘ve heard of these fruity ones, but I don’t think they’ve made it to us. I’ll have to try ordering some. Or maybe I will just make the ice-cream ones! Yeah, what’s up with the guys not wanting to celebrate? What happened to any excuse for a party?! I still have fond memories when we were in September in China back in 2012. As FIL was working back then still a driver for the politburo he got tons of mooncakes, really tons. After the first week we stacked as many as we could and that small part reach already stunning 26 kg! Sure there were also many mooncakes I wasnt so fond of but the majority got a big thumbs up from me. Can’t say if it is only the older generation eating mooncakes as my wife loves them and all her friends as well. OMG, that’s a lot of mooncakes! I think they keep forever, too. How long did it take to eat them all? Not only do I like moon cakes, but the ones with the egg yolks are my favorites. You’ll notice I said like not love. As Andy said, the Chinese aren’t known for delicious desserts. A decadent chocolate torte is more to my liking. The Philippines has some fantastic desserts acquired during their 400 years as a Spanish colony. My favorite there is sans rival. The trick with moon cakes is to cut each cake into four or eight wedges. It’s quite tasty when you share it with your friends. How big are the mooncakes you slice into wedges? We had pretty small ones. Oh, yes, we had Ube cake recently and that was delicious! Very light and such a gorgeous purple. It did, however, lose out to my Devil’s food cake with poured ganache frosting at the annual Labor Day cooking contest on my block. I think we’re talking about the same size of moon cake, about three inches across. It just seems too heavy to eat the whole thing all at once. I like it better two or three bites at a time. Ours were square, so we cut off the edges, rather than doing wedges. But now I cut them in half and pry out the yolk first! I actually LOVE moon cakes. Though they are so rich I can only have a small bit at a time. Takes me a couple of days to eat one by myself, and definitely mean to be shared, and best served with strong tea and a wedge of pomelo to cut through the richness. And the yolks are my favourite part. They are traditionally significant because a full golden yolk looks like a full moon when you cut it open. Bear in mind, when these cakes were first introduced, everyday folks didn’t have rich food or desserts very often (even eggs, for some, were precious protein source that were reserved as special food when you’re unwell). That’s why having a preserved yolk encased in a rich paste is considered a seasonal treat. 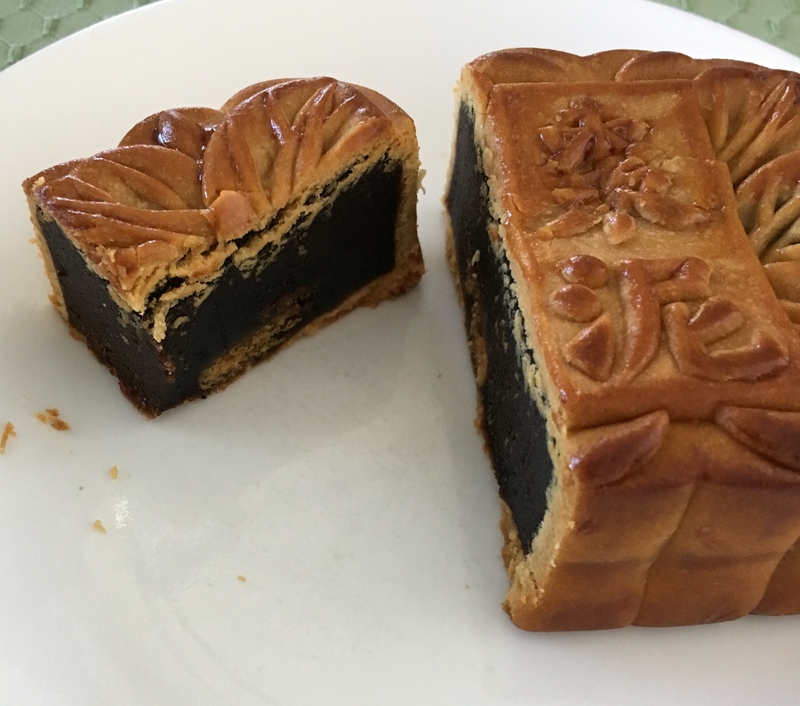 The good quality moon cakes do not have dried up yolks – they are smooth and creamy, rich in natural oils – almost the same texture as the bean paste, except a little gritty and crumbly. The saltiness is mean to balance the sweetness of the bean paste filling, in the same idea as salted caramel. Now, the sweet filling should be comparable to marzipan in texture and consistency, without the almond essence of course. Okay, I finally had to google pomelo, because at the Farmer’s Market here, a pomelo is a kind of giant grapefruit. Next year, I will find some to go with my mooncakes. Maybe. Sadly, all our yolks were dry and salty and I do not recommend them. Only the animals in our house were happy about the yolks! Yeah, times have changed a lot. Once upon a time in America, a tiny peppermint candy was a special, expensive treat. So was an orange. Or at least that’s what Laura Ingalls Wilder wrote. Now we are up to our eyeballs in sugar and chocolate. Wow Autumn, you went and actually bought mooncake! I’m so proud of you! I gotta say I’m one of the weirdos that do not like mooncake. It’s just too… rich. Although I know in China they have new variations of mooncake that are much better! (basically, no egg yolk, haha). In Vietnam we also celebrate moon festival so my aunt used to send us mooncake every year in the mail. I think it still tasted bad back then, but I ate it because it was confirmation of my ‘culture.’ I’m Vietnamese, thus I eat mooncake! I didn’t eat any this year. But man, more than mooncake I want fall colors. I missed them in Minneapolis. Darnit. LOL, you should be proud of me! Mainly because I had to hunt for those mooncakes. Many places were sold out. So that we the first time you tried mooncakes then? I have a feeling that most people don’t like them. A few years ago I came across mooncakes for diabetics, they were lighter, more flavoursome and most importantly no solid chunks of egg yolk. I hope you can find them next year cos I think you’d enjoy them. Yes, got that egg yolk on the first try! In LA, the mooncakes appear to be very traditional. I guess we will have to travel to Asia for progressive mooncakes. Yeah, mooncakes. They’re alright. Used to the egg yok thingy. They’re kind of like McDonald’s burgers though, they don’t change. You see, the funny thing is work gave us cakes for the Mid-Autumn fest. I took mine home and threw them out. After the break, something in the teachers room started to smell really really rank, eventually I discovered one of the Khmer teachers had stashed his cakes in his desk….yeahhhhh. I took them out. Of course, I told him where I put them and then I saw him take them to the Men’s Toilet…ahhhh, where I’m sure the smell was sure to grow! Hazmat suits for the men’s toilet, stat! I am actually kind of appalled that so many people dislike mooncakes. I love them, but only one very specific kind (because I grew up on them). My favourite are the lotus seed paste ones with one (and only one) egg yolk in it, but I generally like any lotus seed paste mooncakes, whether or not they have the yolk in it or not. That’s because I find lotus seed paste less sweet than dates, and it has a light, nutty flavour. I like the yolk for the saltiness that evens out the sweetness in the lotus seed paste. That mooncake I just described is basically the Cantonese style mooncake. Typically, mooncakes are eaten slowly (and in very small slices) accompanied by Chinese tea. The mooncake is really creamy and oily (and as Mary has said) a massive calorie bomb, and the lighter bitterness of the tea sort of leavens the heaviness of the mooncake. It’s supposed to be eaten leisurely and shared with family, small bites of cake with small sips of tea. By the way, if the mooncake you had that you disliked is the one you have in the picture of this post, the filling isn’t red bean paste, it’s date paste. (It’s the two characters written on the top of the mooncake.) Most mooncakes are labeled on the surface with their filling. I personally dislike date paste (it’s way too sweet for my liking), so I can’t blame you for disliking it! Each region of China has their own version of mooncake, and they’re all quite different. When I lived in Beijing, I was so excited for the mid-Autumn Festival, and was seriously disappointed with their overly sweet, sticky, date-and-nut filled mooncakes. Since Andy is from Hong Kong, I bet his family traditionally eats a similar style of mooncake as I am used to. But here’s a link to an illustrated mooncake chart. The ones that are most likely sold in LA are the Cantonese-style ones. If you read the fine print on the box labels when you buy mooncake, they typically have (in small print) the type of fillings the mooncakes have, and you can pick out ones that you might be interested in trying. I’d agree, the lotus one is the best, and small slices are also the best. I’ll have to do some editing, thank you for advising me on the Chinese characters for date paste. My husband was no help, even though he did proofreading! Unfortunately, I am always a little late remembering to get mooncakes, and the selection is limited. Next year, lotus only! If possible.